My mother was an exceptional cook and was forever tasting and testing. At times, we children - her guinea pigs - were grateful for her experiments. One year Mother decided to create the perfect cake with 'grape-flavored' frosting. Not only was the frosting a beautiful shade of pale lavender, but she taught herself how to pipe frosting grape-clusters around the top and sides of the cakes. I loved the contrast of the dark green leaves and twisting vines. Mother's grape-cake project lasted for about five weeks and I loved every bite of the concord-infused flavor. After Mother felt she had done her best, that was it. The grape cake never appeared again. Perhaps she forgot about it as she moved on to other recipes or maybe it was just too much work. 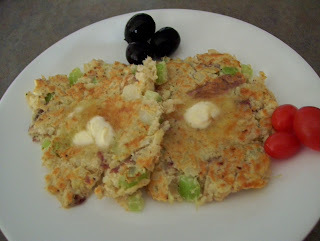 As I thought about those distant grape cakes, I wondered if I was in a recipe rut and went through all of my cookbooks, pamphlets, scribbled papers and magazine clippings. I was stunned to find words like “Great", "Wonderful" and "Family loved this" in my own handwriting. Recipes I had only made once or twice and now, I had almost no memory of them, but promise to revisit them soon. Today's recipe is one my mother made and was passed down from her mother. It has all the requirements of a perfect family recipe - it is easy to make, tastes wonderful and has comfort-food quality. It is a recipe to add to your file and, hopefully, to remember. In a medium bowl, flake tuna into small pieces with a fork. Add potato and mix well, breaking up any large pieces and mash with the fork. Add egg and blend well. Fold in celery pieces and season with salt and pepper. Preheat griddle to med-high and spray with a vegetable oil. Place large spoonfuls of mixture on griddle and press with the back of the spoon to measure 4-5 inches across. When nicely browned, turn patties over to brown the second side and press down gently with the back of the spatula. Remove patties to serving plates and place a pat of butter or margarine on top of each patty. Makes 5 patties. *This recipe is a great way to use leftover boiled or mashed potatoes. I usually use red potatoes. If you are on a tight budget, add another egg and more potato and you can get two more patties per can of tuna. **This recipe may be doubled. 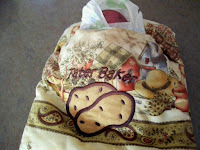 ***No cooked potatoes on hand?...make or purchase a quilted 'tater-baker' envelope (see below). You can bake 1-2 potatoes at a time in it using the microwave (3-4 min. per potato). The potatoes will come out like oven-baked in taste and texture. Side dish recommendation: baby peas, baked beans, fresh fruit and/or vegetables, corn on the cob. this potato "pocket" made our dinners so easy to prepare... it literally takes 5 minutes to make a bake potato, that would normally take 10 times longer using the oven... That was a great gift, thanks Diane!